Create unique and beautiful rings! This class teaches texturing, shaping and riveting as well as creating nail head and balled headpins. Transform flat wire into ring bands and individualize your piece with favorite sayings and design stamps. Lastly, rivet on a gemstone to complete your creation. This class has a running time of 1 hr, 11 minutes. Large Wrap and Tap Plier - $28.60 - You may also use a ring mandrel or large dowel to shape the band. Table Vise - $24.20 - We carry a handy table clamp vice. If you already have a vice on your workbench, it will work just fine. Flat Sanding Sticks, Set of 8 - $9.50 - Or use 400 and 600 grit sandpaper. Replacement Tip, Large Diamond Bead Reamer - $2.95 - If yours goes dull. You can also use it in a pin vice to make a hand-held reamer. Small Files, Set of 6 - $7.00 - For filing out the hole for the rivet. You can also use the Electric Bead Reamer for this step. 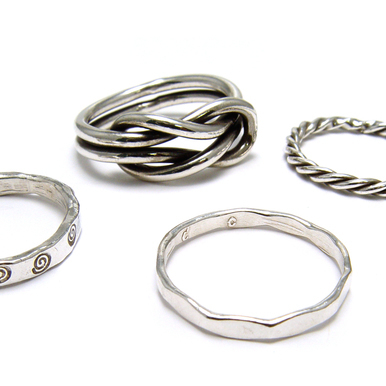 This project teaches you many processes in order to make this ring, annealing, shaping, measuring. Really was very informative. Kriss gives many great tips and enjoy all of her classes. There is way too much unnecessary chatter (i.e., 7 minutes to list the tools and materials needed for the project)! I found myself using fast forward throughout each segment until I finally gave up watching altogether. I will say, though, that this level of detail is probably good for a beginner. However, it's overkill for anyone with some experience. Thanks for your feedback. We love that this design sparked interest and that the ability to fast forward came in handy. The way the classes are broken down into segments is helpful for getting back to the needed content more directly. If you decide to make the Riveted Rock Band in the future and need to refer to a specific step, the details will be available. I love this class. I made my rock band ring. I used a beautiful coppery brown color pearl. I just finished the folded cuff bracelet and my ring goes perfect with it. I wish you carried more interesting beads like Kriss' rings. I have trouble finding interesting rocks like she has. Thank you again for offering the classes so we can learn! However, not clear how she knew where to put the mark when deciding the area to stamp. This was a really fun project. Kriss does a great job of explaining how to ream a bead, make a balled head pin and rivet a stone on a ring. I loved the stones she used, but could not find similar ones (flat with a center hole) locally or on line. I liked the class but she didn't show how to rivet with the balled head. I watched this entire video to learn just that technique and was very disappointed. What's up with that?